NEW! Cayucos Beach Cottage - Walk to Shore & Pier! 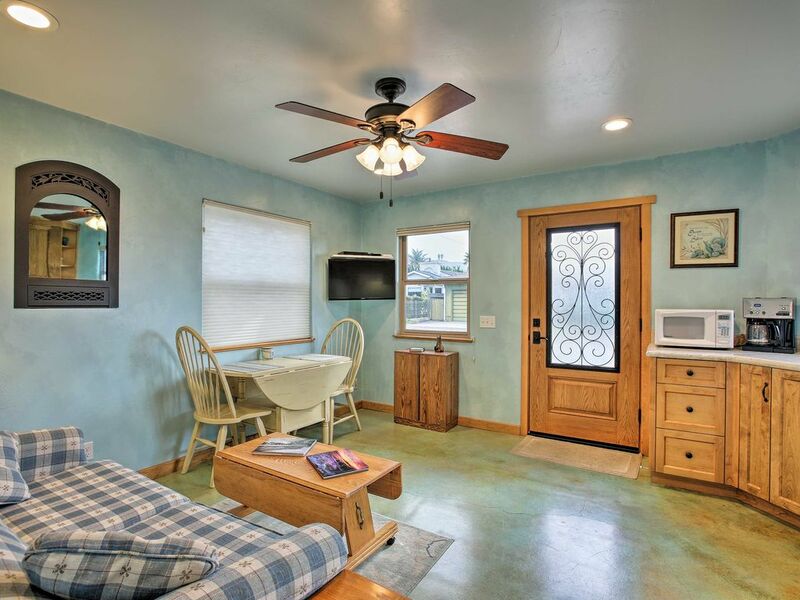 Book this Cayucos vacation rental and stay 250 feet from approximately 6 miles of beach on the central California coast! The State Beach hosts a sandy shore and fishing pier, excellent for reeling in a fresh catch or spotting ocean wildlife like otters, seagulls, and more. At the cozy 1-bedroom, 1-bath home, up to 4 guests can enjoy modern comforts including a full kitchen and private patio. An annual glass festival, antique fair, and 4th of July festivities help make this destination unique! Driveway space for 2 and ample street parking in this quiet, residential neighborhood allows you to unload your luggage with ease. Step inside and unwind in the bright, open interior space then throw a family favorite on the flat-screen TV. The fully equipped kitchen features stained concrete floors, ample counter space, and all the essential appliances, cookware, dishware, and more to help prepare your go-to recipes. Share home-cooked meals at the fold-leaf table or head outside to dine al fresco. After walking down to the beach and watching the sunset over the ocean, retreat to the comfort of your queen bed while 2 additional guests claim the sleeper sofa. This home comes stocked with fresh linens, towels, and basic toiletries for your stay. All the best attractions in town lie a short walk away when you're prepped and ready for the day. Check the city website and look at the schedule to plan a visit to the Glass Festival, Antique Fair, Car Show, or another event. Of course, you'll want to spend most of your time on the beach just a quick, 250-foot walk away. Make your way down to the pier, fish off the edge, say hello to the friendly otters, and bring your binoculars to spot boats sailing past the coast. You'll find a variety of tasty restaurants and quaint boutiques for you to peruse in town. And, with scenic mountains surrounding the city, opportunities for hiking and other outdoor recreation are endless.